My Bible has about 200 sticky notes sticking out of it. Another 15 bookmarks and 3 pieces of ribbon. I like to mark things in my Bible, and even have a separate journal so I can sometimes write what a certain scripture made me feel or think about. As a kid I remember I would just skim over it. Never really taking anything away with me. As an adult I like to get deep into the words and really try to grasp what I am reading. I like to highlight, book mark and write about what I read. Doing this helps me to get a deeper understanding of God's word. 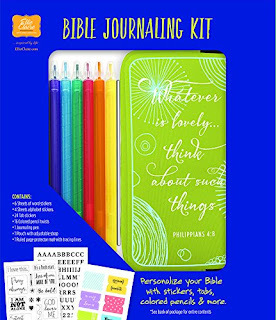 The all new Bible Journaling Kit helps me to do this! Now keep in mind I already marked up my Bible, the this kit is a much prettier way of doing it! Plus the labels don't rip as easily as my sticky notes. No matter how you journal or mark up your Bible or even if you just read it. It is so important to get into God's word daily.